<i>Human Rights in the Arab World: Independent Voices</i> offers perspectives from those at the forefront of research and debate at the intersection of human rights and Islam, globalization, transnational advocacy, and the politics of key states such as Egypt, Morocco, and Yemen. 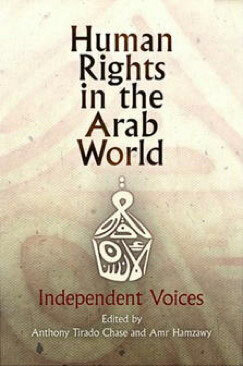 Human Rights in the Arab World: Independent Voices offers perspectives from those at the forefront of research and debate at the intersection of human rights and Islam, globalization, transnational advocacy, and the politics of key states such as Egypt, Morocco, and Yemen. Some chapters provide essential historical background to current political realities, while others consider ways to confront this region's practical and theoretical challenges to human rights. By placing the question of human rights in the often tragic context of Arab politics, the very real stakes are made clear. This book is available from University of Pennsylvania Press. To order the book from Penn Press, please click here. Amr Hamzawy is Senior Associate at the Democracy and Rule of Law Project, Carnegie Endowment for International Peace. Anthony Chase teaches in the Department of Diplomacy and World Affairs at Occidental College.